The Laerdal Compact 800ml Suction Unit (LCSU 4) is a lightweight, portable Suction Unit that is ideal for use by first responders. 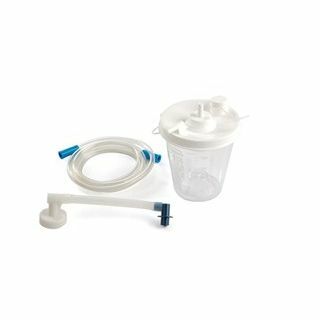 As the canister is disposable, the Canister for the Laerdal Compact 800ml Suction Unit (LCSU 4) is perfect as a replacement. The canister can also be used as a spare if you feel like you'll need to change it soon. As the 800ml Canisters are disposable and cannot be cleaned for reuse, having a spare for backup is ideal to ensure you have a constant supply. The vacuum tube and patient tube are also included with the canister, providing you with everything you need to use the Suction Unit again. The Canister for the 800ml Suction Unit has an internal filter in the lid so you don't have to purchase them separately when you order another canister. The filter automatically stops suction/flow when the canister is full, or the filter becomes saturated if the unit tips onto its side during use. This helps protect the machine from permanent damage. The Canister for the Laerdal Compact 800ml Suction Unit (LCSU 4) will be subject to a delivery time of 3 - 4 working days after the point of order. For more information, contact our Customer Care Team at 020 7501 0593.